A membrane consisting of polymer fibres and proteins makes a novel filter for tiny, nano-scaled particles in aqueous solutions. The result of such a research, which was done by Professor Mady Elbahri and his team from the Institute of Material Science at Kiel University (KU) and the Institute of Polymer Research at Helmholtz-Zentrum Geesthacht (HZG), has recently been published as the cover article in the current issue (21.11.2012) of Advanced Functional Materials. A Nanofluid, which means a colloidal suspension of e.g. 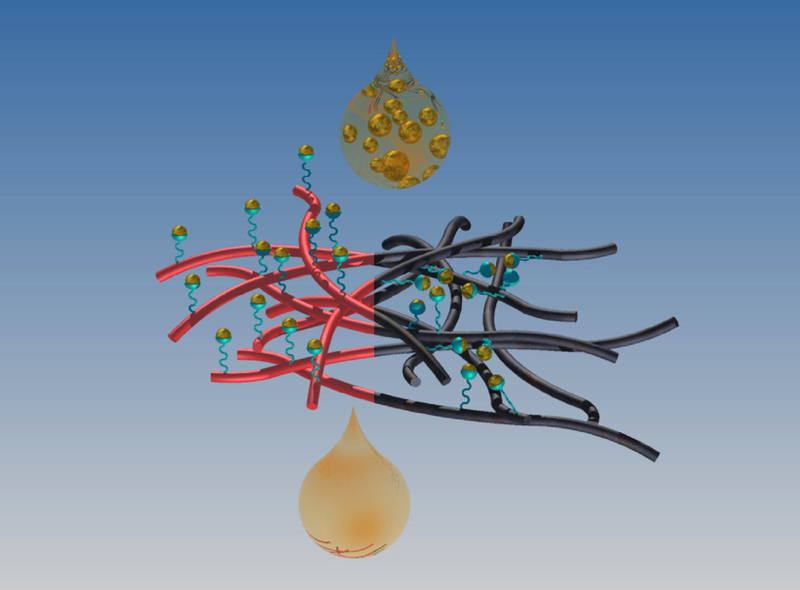 metal nanoparticles in water, passes easily through commonly used macroporous polymeric mem-branes. The particles are too small to be held using hole diameters between three and four micrometers. In addition, the particles would block smaller sieve openings rapidly. Hence, pressure would be necessary to filter out the fluid. The nano sieve will allow filtering very small particles or biomolecules and or-ganisms such as viruses out of water. 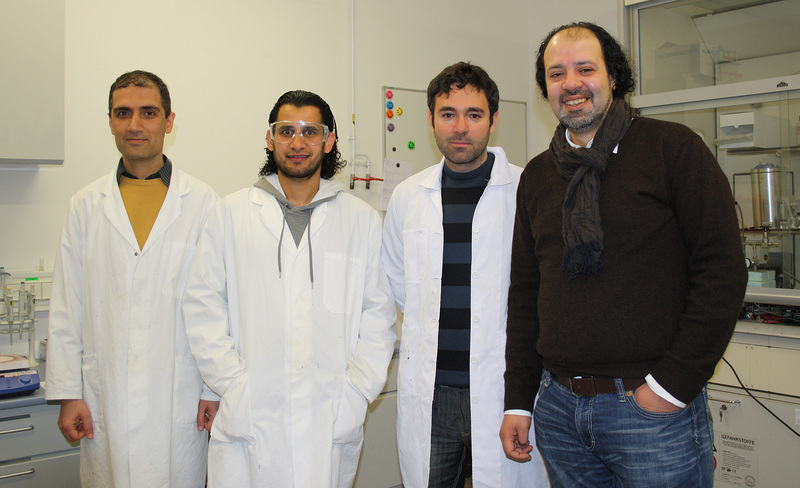 The scientists involved have already pat-ented their innovation, a bio-nano-composite, in Europe. Another patent for the USA is on its way. Besides its application in water filtration, the nano sieve shows great potentials as solar absorber and as a catalyser. 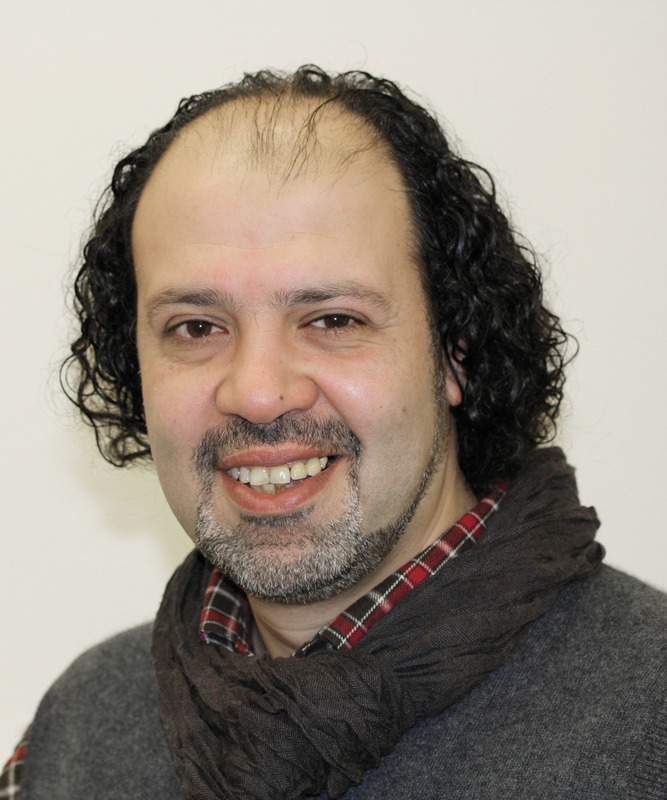 “All in all, the result is a breakthrough towards the design of an operative filtration process, as a new route for the fabrication of functional materials, and offers commercially attrac-tive efficiencies at a low cost”, says Elbahri. “Smart Metal-Polymer Bionanocomposites as Omnidirectional Plasmonic Black Absorber by Nanofluid Filtration“; Mady Elbahri, Shahin Homaeigohar, Ramzy Abdelaziz, Tianhe Dai, Rania Khalil, Ahnaf Usman Zillohu. DOI: 10.1002/adfm.201200768, Advanced Functional Materials, 22, 4771, 2012. Caption: The nano scientist Mady Elbahri and his Team are able to filter out nano particles from liquids. 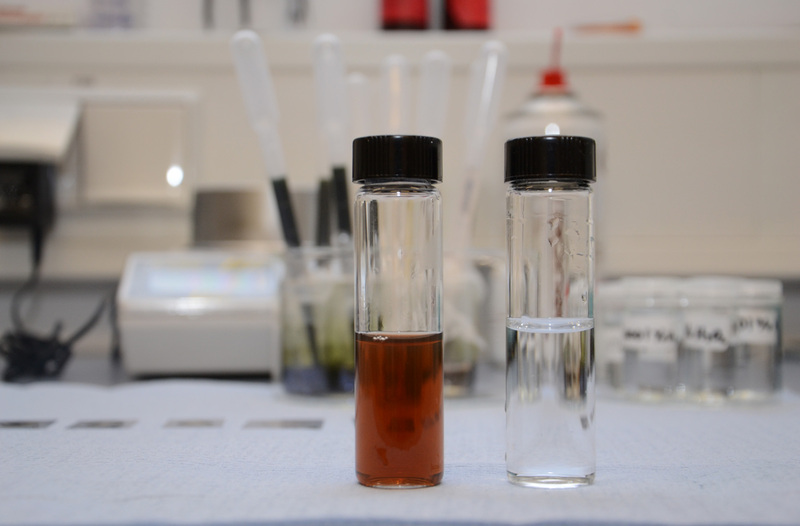 Caption: The Nanofluid with particles of gold (left) and the solution filtered (right). All metal paticles are filtered out. Caption: The Helmholtz-University Young Investigators Group has developed a membrane, which can be used for filtering small organisms or viruses from wa-ter. From left: Ahnaf Usman Zillohu, Ramzy Abdelaziz, Dr. Shahin Hamaeigohar and Professor Mady Elbahri. 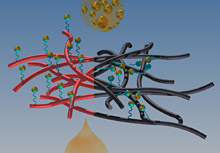 Caption: The graphic shows a membrane consisting of polymer fibres (red and black) with proteins (blue) that have activated their ability to capture all the metal nanoparticles. When the Nanofluid with metal particles (top) passes through the sieve, the proteins hold the particles. At the end, there is a liquid which is free of particles. Caption: A microscope image of the membrane after the filtering. The gold particles are well dispersed.